Designed to mount to standard T-Post or to tree using ratchet straps. V-Groove in back designed to fit T-post perfectly. Concave back and grooves for ratchet straps allow for mounting to tree. 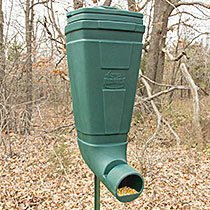 Made from tough heavy duty polyethylene with 80lb corn capacity.